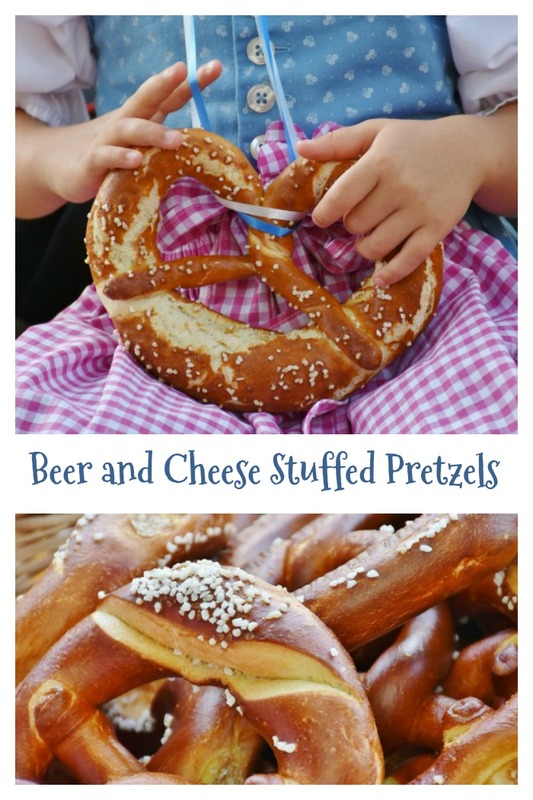 Celebrate Oktoberfest and National Pretzel Day with these Beer and cheese stuffed pretzels. Oktoberfest is an autumn festival which is held in Munich, Germany, in late September and early October. It features the drinking of large amounts of beer, great tasting food and amusement rides and activities. 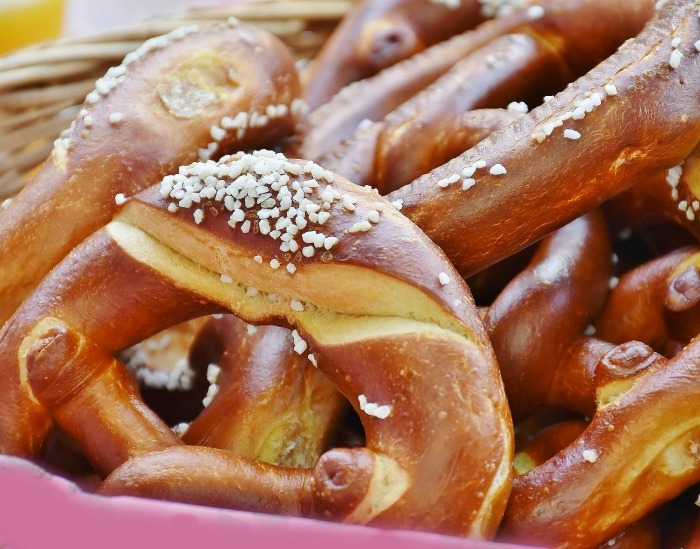 Pretzels are also associated with Oktoberfest, since they go so well with the taste of beer. The Bavarian pretzel is a classic Oktoberfest snack. It had its humble beginnings in the 6th century when Italian monks made pretzels from left over bread dough. The traditional pretzel shape is meant to symbolize the arms folded in prayer. 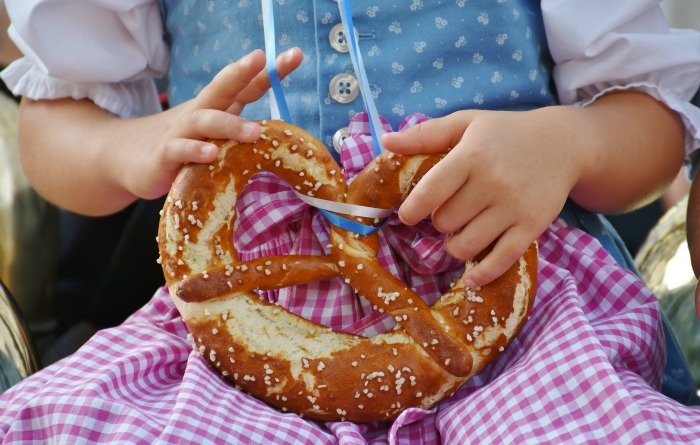 European immigrants brought the pretzel to the USA in the 18th and 19th century. These pretzels are easy to make and start with a tube of refrigerated pizza crust to make them ready in just 30 minutes. The hardest part of making the pretzels is actually shaping them, but you get better at it as you keep trying. The taste is full of comfort food goodness. A warm crispy and salty coating stuffed with the delicious taste of beer and cheese gives a true Oktoberfest feeling. Would you like a reminder of this recipe for Beer Stuffed Cheese Pretzels? Just pin this image to one of your cooking boards on Pinterest. Heat oven to 400°F. Line a large cookie sheet with parchment paper. Open the dough onto a work surface that has been lightly floured. Roll dough into a 12x14-inch rectangle. Using a sharp knife, cut the dough lengthwise into 4 strips. Stretch dough over the filling; brush edges of the dough with some water, and pinch to seal. Pick up ends of the strips and gently stretch each dough rope to 24 inches long. To make a pretzel shape, form each rope into a U shape. Twist the ends twice. Pick the ends up and fold over so they rest over the bottom of the U shape. Tuck one end under the dough at bottom of U shape; and the other end will lie over dough at bottom of the U shape. In small bowl, beat together the egg and 1 tablespoon beer with a whisk until it is blended and set the mixture aside. In large microwavable bowl, heat the remaining beer on High for about a minute and a half until it is hot. Slowly add the baking soda; stirring until dissolved. Dip each pretzel, into the beer and soda mixture. Remove with a large slotted spoon and place on a baking rack. Let the pretzels stand at room temperature 5 minutes. Brush the pretzels with egg mixture, and sprinkle with some coarse salt. Transfer to cookie sheet and bake 11 to 15 minutes or until tops of pretzels are dark golden brown.